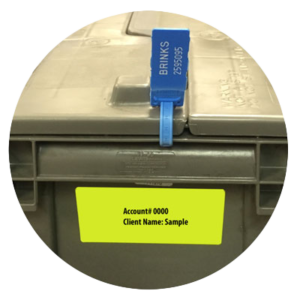 Here are the steps for setting up your Miles Franklin Precious Metals Storage. Please feel free to contact us with any questions that you may have. Client completes the customer agreement, and the original is then mailed to Miles Franklin and a copy may additionally be sent by email to: apply@preciousmetalstorage.net to begin the application process. Agreement is executed and signed by the President of Miles Franklin, which a signed copy is then mailed back to the client for their records. Client may start sending in their precious metals or make a purchase as soon as a copy of the agreement is received my Miles Franklin either by mail or email. The set up cost is $89.00, which is waived for a purchase over $15,000. 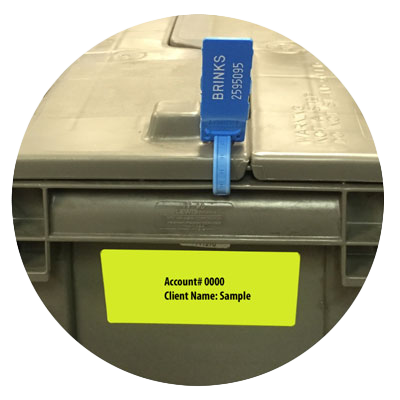 a) Precious Metals may be shipped from the client by Brink’s generally starting around 200 oz. gold/platinum or more or 5000oz. Silver or more. Client will drop off their goods at the nearest Brink’s location arranged by a Miles Franklin representative and shipped insured by Brink’s Global Services on the Miles Franklin account. All quotes for shipping will be finalized and accepted in advance. Drop off at a Brink’s facility requires a Driver’s License or Passport copy to be sent to Brink’s prior to scheduling an appointment. c) Once the precious metals are received at our warehouse, the cost to ship to Brink’s Canada is $140.00 per 50oz. gold/platinum and $260.00 per 100oz. gold/platinum, insured and includes all customs fees, etc. Silver is $0.35 per oz / $175 per 500oz box. Goods are shipped to Canada by UPS overnight, insured (tracking number is available upon request). d) If purchasing precious metals directly from our affiliate company Miles Franklin Ltd. Please contact us at (877) 675-4705 or internationally at (952) 582-6316 to make a new purchase. We can help you ship your Precious Metals from Switzerland to our Canadian Vaults. All metals are counted and verified under recorded camera. Next the precious metals are sealed in a stackable hard grey storage bin / box with Brink’s pull tight security seal on each side. That number is entered into books and computers to ensure the client’s box is associated with the correct account. Additionally the clients name is affixed to the bin as well. The client will receive a copy of the Miles Franklin and Brink’s inventory Certificate signed by a Brink’s Authorized employee as well as the President of Miles Franklin. The seal number is recorded within internal operating procedures, insuring no tampering has occurred. 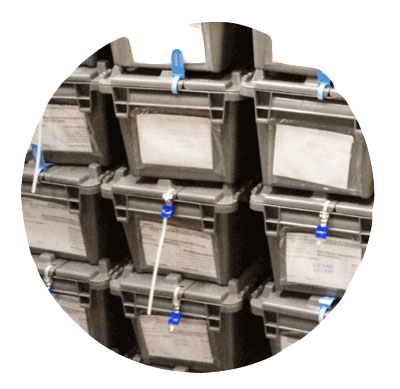 Silver Eagles, Maple Leafs and sealed Gov’t Coin Mint Boxes of all types are stored palletized with the client’s name and account number sealed to each and every box. 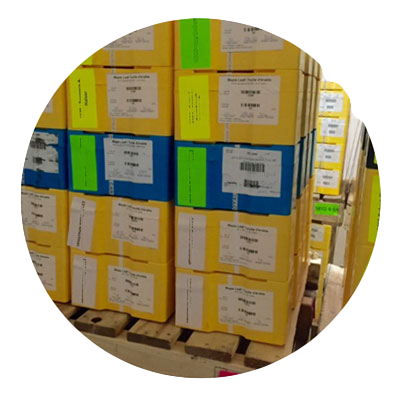 Each and every box is registered to a palette number recorded and entered into the accounting system. 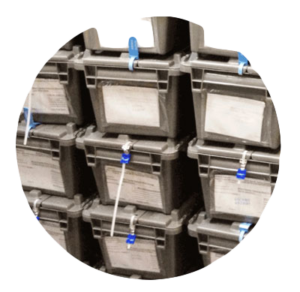 The guarantees that the boxes are easily located, accounted for, and audited each year by Inspectorate to insure the integrity of the fully segregated program. a) Transfer paperwork for a withdrawal selling. Clients must sign and send back a withdrawal form to Miles Franklin in advance of a sale. Miles Franklin will coordinate a shipment on our UPS account, fee’s apply on a per case basis. Clients are generally paid in 5 business days or less by bank wire or check. 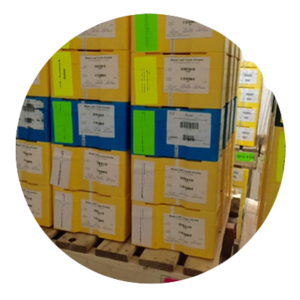 Clients may take back personal possession of their precious metals, either in person or by shipping back first to our warehouse in Fargo, ND. Next precious metals may ship anywhere in the USA by UPS or US Postal insured. Quotes from return shipments will be made on a per case basis. *Additionally clients may opt to ship their goods overseas by Brink’s Global Services which we can help arrange. c) Adding metals may either be accomplished through purchasing from Miles Franklin by contacting us at 877-685-4705 or you may send in your own. d) Clients may set up an appointment through Miles Franklin to arrange an in person drop off or pick up, with a maximum one appointment per month. a) Clients must sign and send the withdrawal form to Miles Franklin in advance of closing their account. Client may sell back their metals to Miles Franklin Ltd, or they may also schedule an appointment to pick up of their precious metals in person. All clients must sign and return the indemnification release to Miles Franklin prior to entering a Brink’s facility. b) Clients will complete the sale with Miles Franklin LTD through their Broker prior to any transfer forms being finalized with Brink’s. Clients are generally paid in 5 business days or less by bank wire or check. a) Credit Card payment on file is used for monthly payments, automatically withdrawn on the 1st of each month. a) Clients will receive an inventory statement of account holdings by email (or by mail if you request) each quarter. Example: American Gold Eagles / Krugerrand’s are 22K and cannot be stored. Pre-1964 Junk Silver Coins or Pre-1933 Peace or Morgan Silver Dollars cannot be stored either. We will buy back your goods in the U.S, and help swap your metals into 24K products sometimes at no fee. Please inquire if you own some of these metals or other non-24K products and would like to discuss a like kind exchange.